Too novel in design to succeed ? Looking through some old photographs at Hertford Local Studies Library, my attention was caught by an old railway photograph. Closer inspection revealed that, not only was the engine ‘joined’ to the carriage, but there were only 4 wheels at the front and 4 at the back. This was obviously a ‘multiple’, or as the Great Northern Railway peculiarly called it, a “motor coach”. Research revealed that, at the instigation of Henry Ivatt, the Great Northern Railway Company had 6 of these built between 1905 and 1906 – strangely three different manufacturers producing two each to slightly different designs, our No.5 being built along with No. 6 in Kitson, Lincolnshire. By today’s standards, the whole setup appears rather bizarre.Starting at the front we have a rather squashed up locomotive with 4 wheels, carrying coal supplies in front of the cab, and drawing water from a tank under the coach frame which is pivoted to the engine. The carriage, comprising a small luggage compartment at the front, offered third class accommodation – smoking and non-smoking. Finally, at the rear was another driver’s compartment (presumably for operating in reverse) from which the driver communicated with the other end, using an electric bell and a chain, passing over the carriage roof, connected to the regulator. The GNR, finding little use for these units, ran ‘our’ No.5 for a short time between Hitchin and Baldock, taking it out of service by 1917 thereafter storing it at Kings Cross for a time. Absorbtion of GNR into LNER in 1924 resulted in an overhaul of all six “motor coaches” although it is known that these units were not popular amongst LNER Area Managers. 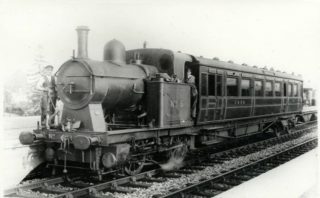 Notwithstanding this, No’s 5 and 6 were detailed to commence a new service (in June 1924 – about the date of our photograph) running from Hitchin to Hertford North. Unfortunately, they ran for only 5 months. Proving troublesome, they were sent to Doncaster and condemned a few years afterwards when the locomotives were scrapped. The carriages, however, survived longer as they were saved and ‘paired up’ into articulated sets. The set arising from multiples numbered 5 and 6 continued to be used on a branch line at Horncastle until it was withdrawn in February 1959. Unfortunately, nothing from these units has survived into preservation, and only photographs remain. This page was added on 29/03/2018. Later on, in the 1930s, the Sentinel railcars were used between Hertford North and Hitchin. They were had names based on old stage coaches and the delightfully-named Bang Up was used on the service for some time.